511618 - BUY NOW All Messy Colors available at: ..... crea-arte gmbh (, Switzerland) ..... Ed Hoy's International (IL, USA) ..... Frantz Art Glass (WA, USA) ..... Tuffnell Glass (East Yorkshire, United Kingdom) Most Messy Colors available at: ..... ABR Imagery, Inc. (IN, USA) ..... AniBeads (, Germany) ..... Artisens Studio (, Hong Kong) ..... Artistry In Glass (Ontario, Canada) ..... Artyco (, Netherlands) ..... Bead Glass (NSW, Australia) ..... beadbox.de (, Germany) ..... Beadpress (, Netherlands) ..... BerlinBeads (, Germany) ..... Flamedame.com (FL, USA) ..... Glasgestaltung (, Germany) ..... Glasperlenkunst / La Casita Bolita (, Switzerland) ..... Glassworks France (, France) ..... Howaco Glass Supply Co. (MI, USA) ..... InsideColors (, Russia) ..... L'Age du Verre (, France) ..... Moretti & More (WA, USA) ..... Neus Shop GmbH (, Switzerland) ..... Nortel Manufacturing Ltd. (Ontario, Canada) ..... Ombos Arts & Beads & Crafts (, Germany) ..... Studio 34 Creative Arts Learning Center (NY, USA) ..... ООО «АРТ-ЛЭМПВОРК» (, Russia) Visit our complete reseller listing. Click here for other interesting Simply Berry discoveries. Testers report that Simply Berry is unique to the 104 palette and is redder/pinker than other 104 transparent purples. 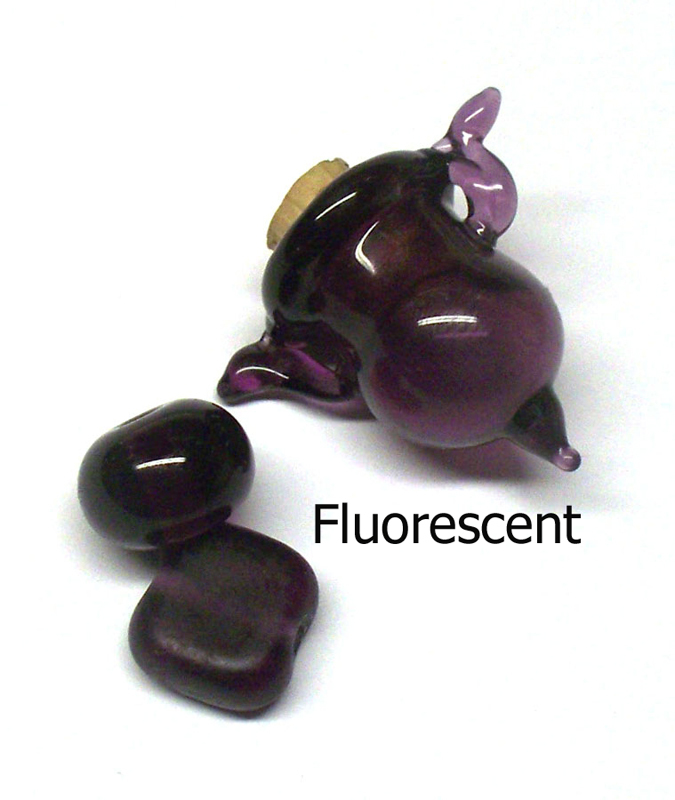 Testers report that Simply Berry shifts in color depending on the type of lighting. Special thanks to Elasia, Genea Crivello-Knable, & Maija-Leena Autio for providing the photos in this section. 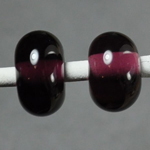 Take a look at how Amy Houston made a series of purple spacers with Simply Berry. Amy Houston used Simply Berry with opal yellow, Val Cox's Enchanted frit, and transparent dark lavender. 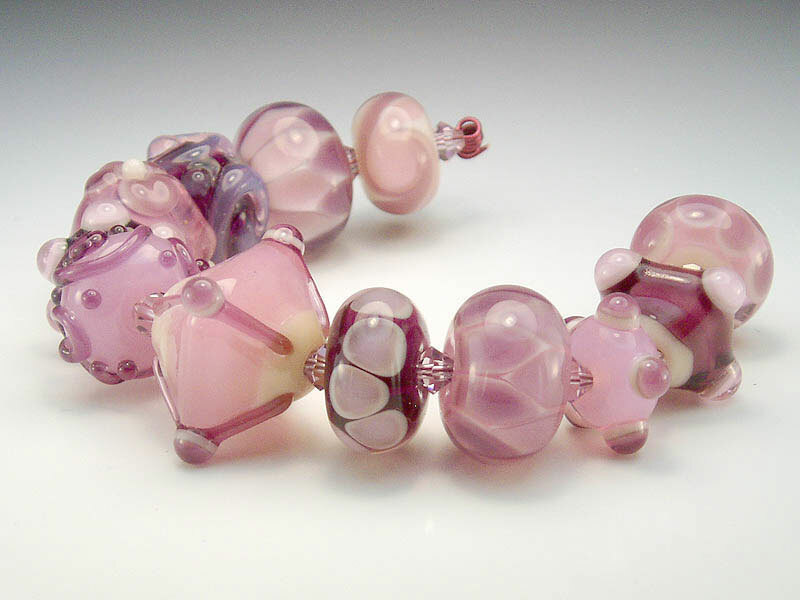 Check out Amy Houston's beads with Simply Berry, Seashell Swirl, and Val Cox's African Violet frit. 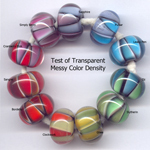 See Darlene Collette's beads made with Simply Berry, Triton & Nyx. 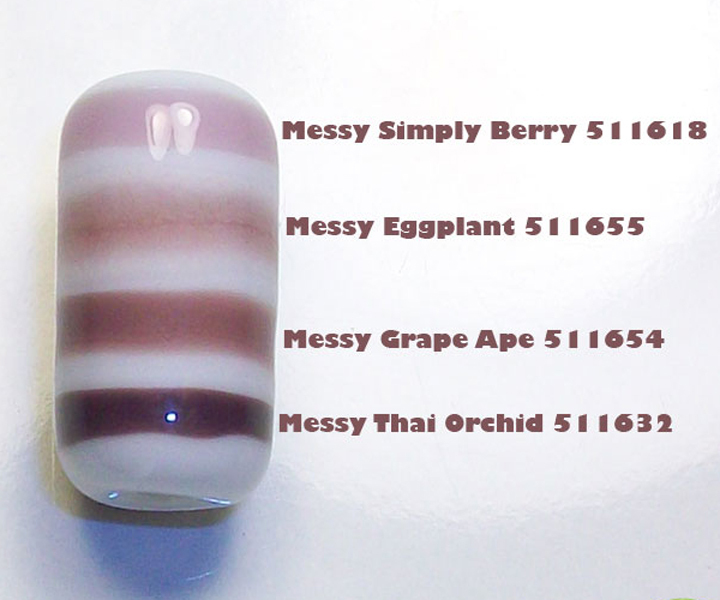 Check out Genea Crivello-Knable's blog about imitating some BE odd lots with Simply Berry. 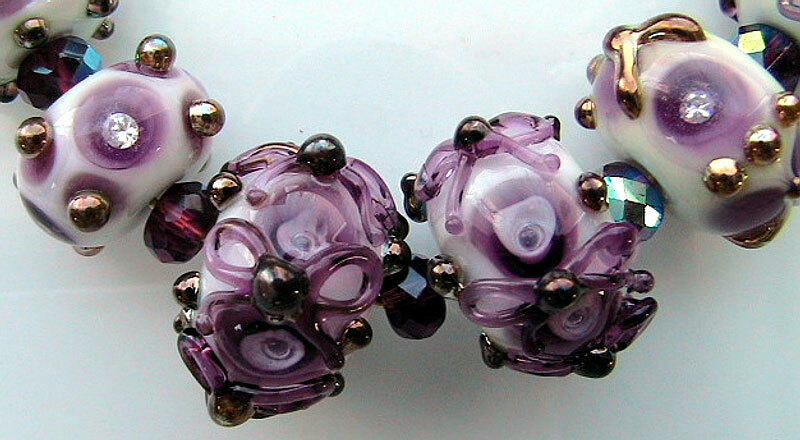 Check out Genea Crivello Knable's tangled vine earrings made with Simply Berry. 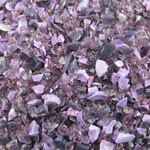 Melanie uses Simply Berry frit in her blend "Bougainvillea." See more of her 104 compatible FrittyBits blends. 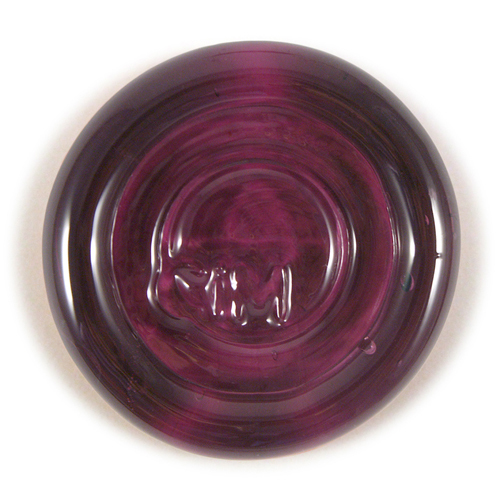 "Simply Berry is a dark transparent amethyst - with a bit more 'oomph' than the Effetre Medium Transparent Purple. 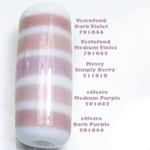 Here we have, Simply Berry on the left, and Effetre Medium Transparent Purple  on the right. 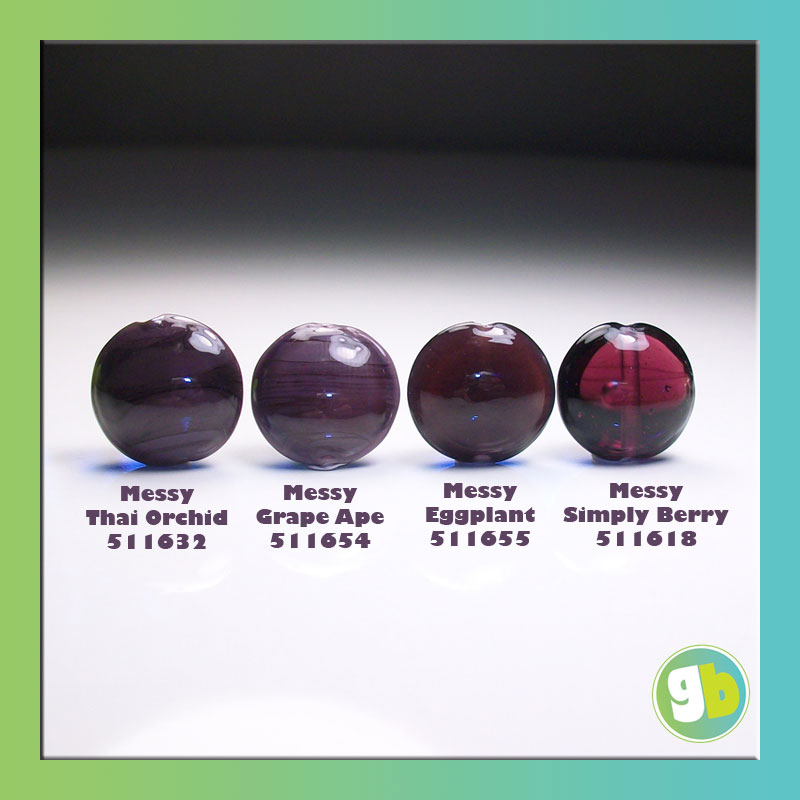 In real life - the Simply Berry looks more saturated in colour, and less like 'just really dark.'" Read more at DragonJools blog. Simply Berry over Dirty Martini. 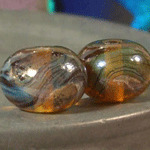 "This bead has an opal yellow core, encased with Simply Berry, then striped with Aurae and some Opal Yellow/Nero Intenso twistie. 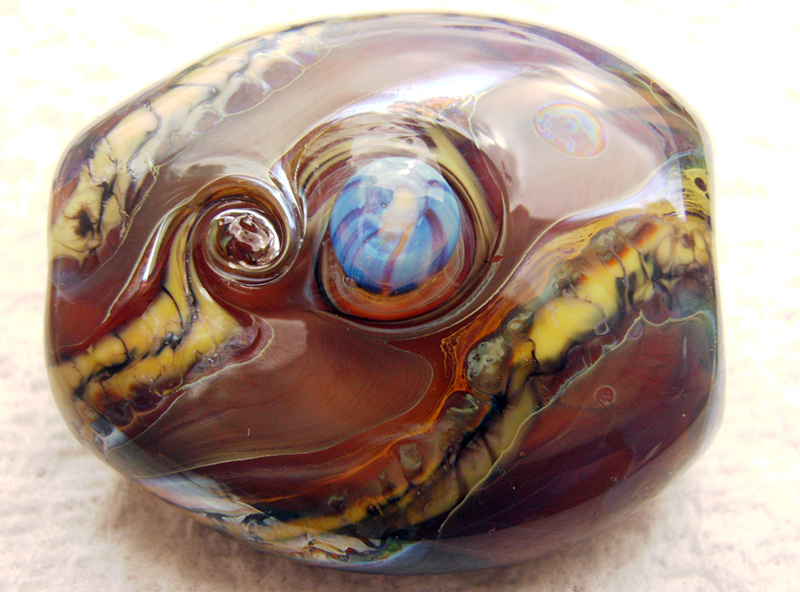 The murrini is opal yellow/Simply Berry/DH Aurae." 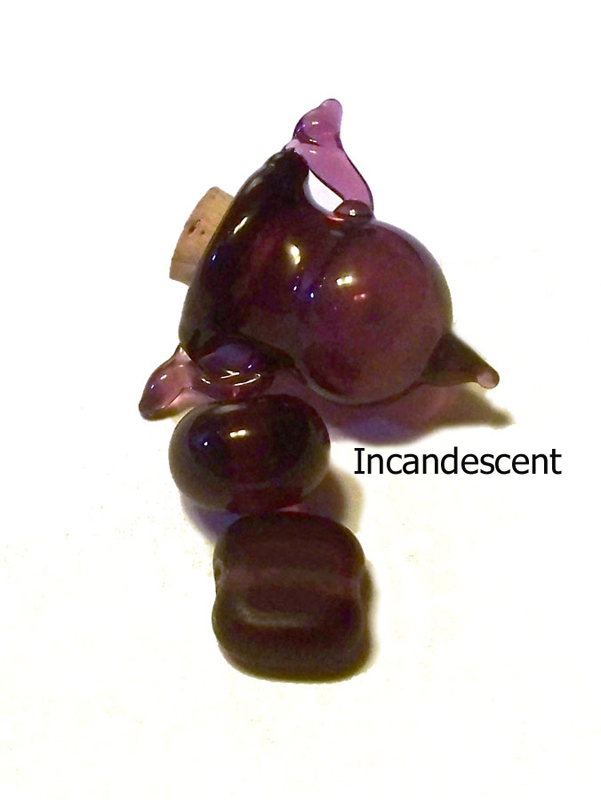 "In this image I shot light through the backs of the purples to demonstrate more of their color. 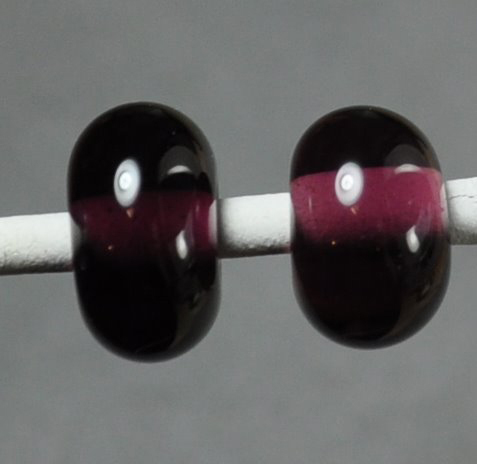 When photographed flat against a surface these purples look almost black. 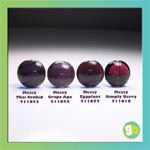 You can see that Eggplant is a very dense opal/translucent color and that Simply Berry is a very beautiful reddish violet." "I was worried that the Simply Berry would be too dark on its own, but it’s actually really pretty. It looks good layered over ivory as well. 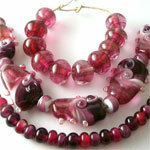 The darker purple beads in this set are Simply Berry." 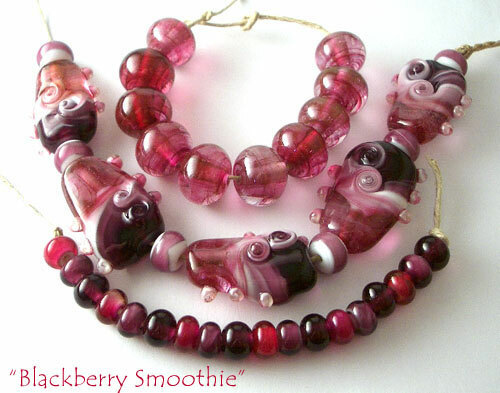 See more of Amy's beads made with Simply Berry. 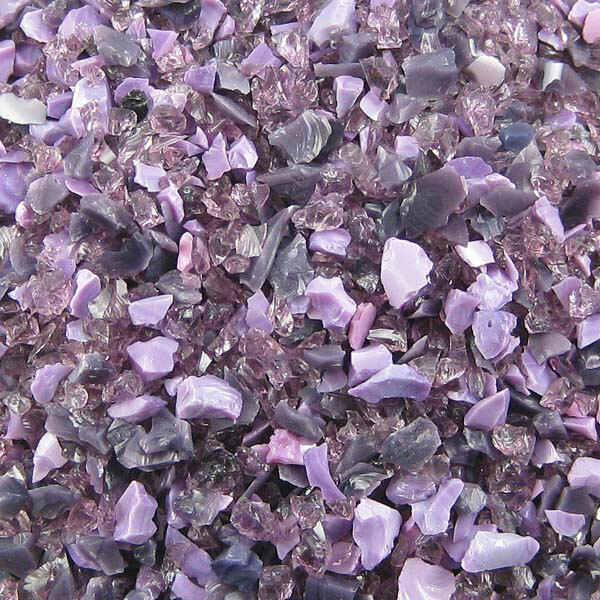 "Simply Berry in its original form worked out really nicely as a layering color - a pretty, slightly less brown/pink than the Effetre Amethyst." Read more at Kandice's blog. Bonnie made twisties with a base color rolled in silver leaf, with thin stringers of intense black. 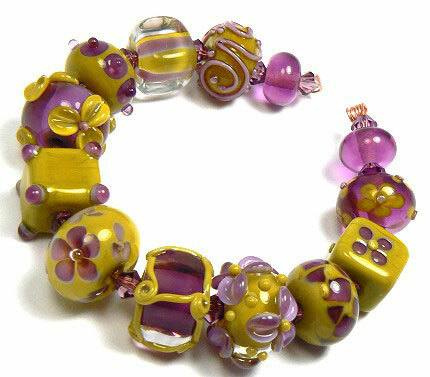 She used effetre light brown as a base for the beads. 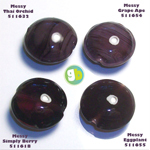 "The Simply Berry twistie on the left reduced to soft blues, grays and purples. 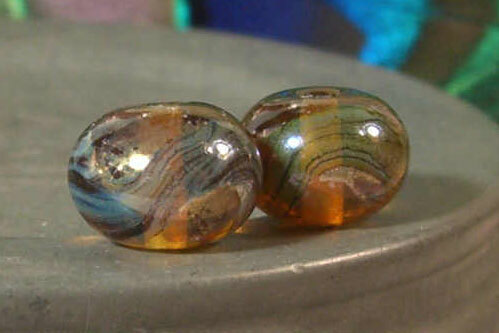 The Rubino Oro twistie on the right reduced to yellows and greens. 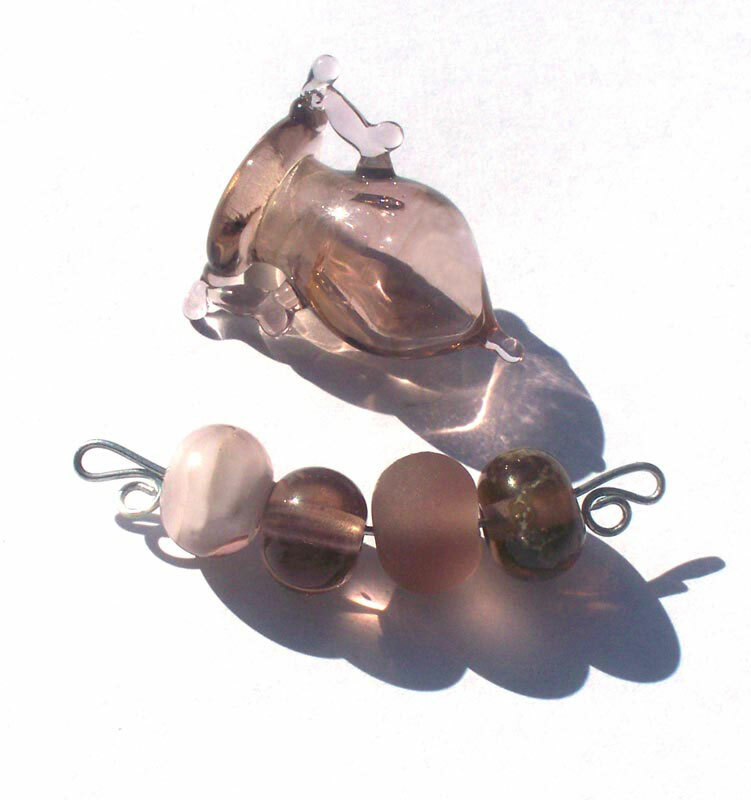 Both stringers spread across the superheated base bead."